Svalbard’s polar bears, which belong to the Barents Sea population, were hunted intensively up to protection in 1973. After that, the population recovered significantly. But in more recent years, sea ice loss in this area has been more severe than in any other polar bear habitat. How are they doing now? From 1870 to 1973, on average 300 bears were killed or captured live by Norwegians every year, mostly in and around Svalbard. In the 1960s, scientists expressed concern that excessive hunting in the Arctic could threaten polar bear populations. From 1973, Norway stopped all hunting on polar bears. Assuming the stock was far below carrying capacity after the intensive hunting, it was no surprise that the population started to recover. By the 1980s, it was believed to have doubled, and demographic data suggested that growth continued to the end of the millennium. 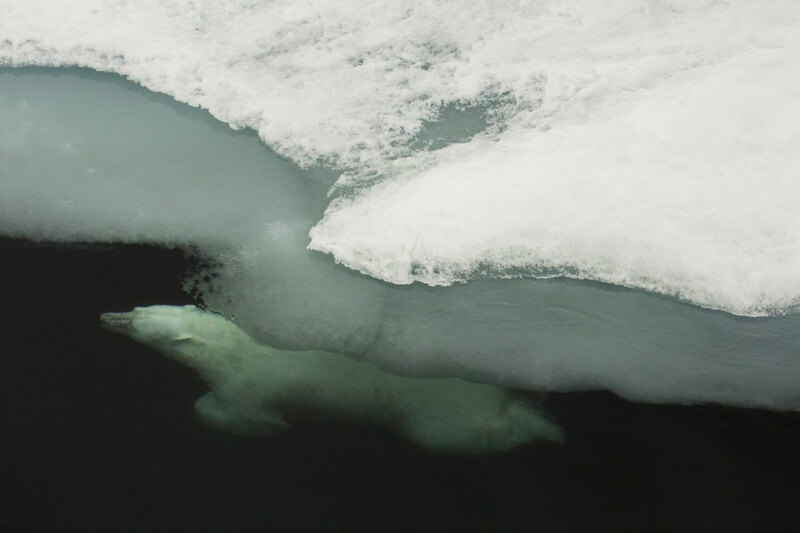 In the 1990s, several toxic pollutants from industrial areas were found in polar bear fat, at levels that could potentially affect survival or reproduction. In August 2004, a large Norwegian–Russian survey estimated that the entire Barents Sea polar bear population numbered 2650. Of these bears, only about a quarter was on the Norwegian side of the border. However, telemetry data show that many bears undertake seasonal migrations. They use the Svalbard area in winter and spring, but migrate northeast to the pack ice and to Franz Josef Land in the western Russian Arctic in summer and autumn. These bears are mostly found not too far north of the sea ice edge. About two-thirds of all the bears in 2004 were up in the pack ice, north of Svalbard and north of Franz Josef Land. Only about 250 bears were found in Svalbard, but we attributed this to an unusual sea ice year when the ice edge was far north of the islands. A polar bear visiting the research vessel Lance during a cruise north of the ice edge in August 2015. Polar bears are curious and are often drawn to ships in the otherwise featureless landscape. Photo: Jon Aars / Norwegian Polar Institute. In the late 1990s, polar bear researchers used the island of Hopen southeast of Spitsbergen, as the base for capture-recapture studies in the spring. They observed that in some years, sea ice formed much later than had previously been normal and that in such years very few females came out of dens with cubs the following spring. This was the start of a dramatic change in the availability of sea ice habitat for polar bears in the Svalbard area. The Arctic as a whole has warmed faster than areas further south, but nowhere have the changes over the last few decades been more profound than in the Barents Sea. The sea ice season is now several months shorter, and the ice edge typically lies several degrees further north than what was normal 20-40 years ago. Hopen is no longer a good denning area for pregnant polar bears. Kongsøya, an island some 250 kilometres further north, which has been described as one of the two denning areas in the Arctic with the highest density of maternity dens, probably did not have a single den last spring. In August 2015, a new survey of polar bears in the Barents Sea area was planned with Russian colleagues. Unfortunately, permission to cover Russian areas was never granted. We could therefore only survey the Norwegian part of the population. A key question for this study was whether the population had stopped recovering after the 1973 protection and if the significant loss of sea ice had reduced survival and reproduction, and led to a decline in the number of bears. The sea ice distribution was similar in the two survey years (2004 and 2015): there was only a scattering of ice around the Svalbard archipelago, and the ice edge was further north. The estimated number of bears in Svalbard was again close to 250, indicating that the part of the population that stays in the area year-round has changed little, despite them being without access to sea ice for a much longer period each year. 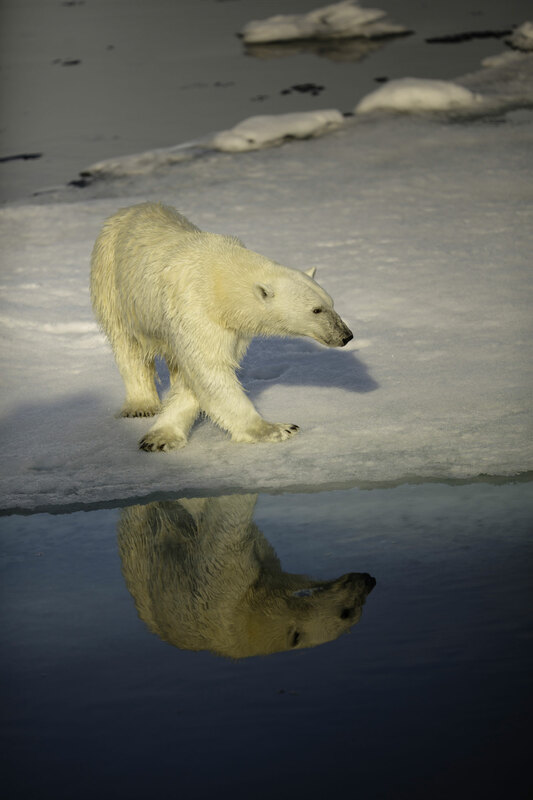 The number of bears in the pack ice was higher than in 2004, although not significantly so. This could indicate population growth, but the higher number could also be due to a net movement of bears westward, from the Russian sector. The proportion of females with cubs was as high as in 2004 and comparable with that observed in other healthy populations. So despite the loss of good denning areas and a shrinking habitat for hunting, Svalbard’s bears seem to be doing fine. Our results indicate that polar bears can survive in the Barents Sea area in the future if conditions stay similar to what they are today. Polar bears can survive long periods without food, provided they have accumulated a good fat reserve during the few months in spring and summer when sea ice is present, and seals are abundant. However, the warming of the Arctic is predicted to continue, and the loss of sea ice around Svalbard is predicted be particularly profound in coming decades. We already observe that bears who mainly live in the pack ice sometimes swim up to several days and several hundred kilometres to reach land, where they can den. Swimming in cold water is more energy-demanding than walking. A further reduction of sea ice habitat could thus be detrimental to Svalbard’s polar bears, whose livelihood depends on sea ice and sea-ice associated seals. Our monitoring programme is designed to detect signs of sudden changes in reproduction and survival.